I sometimes wonder if aliens will have clocks. It seems inevitable, especially if they live on a spinning planet that orbits a star. The motions of the stars as the planet spins, the daily rising and setting of the Sun, the phases of the moon if the planet has one—all these movements fit together like the gears of a clock, ticking away in patterns that seem obvious once you notice them. 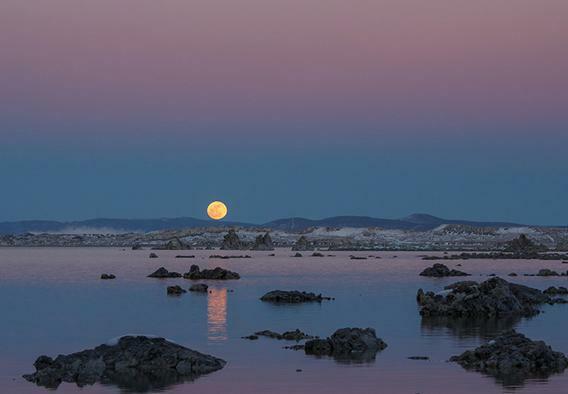 The full Moon rising over Mono Lake, California. Image credit: Jeff Sullivan, used by permission. That’s wild. But there’s more. The pink band across the top of the photo is called the Belt of Venus, and we’ll get to that in just a moment. But perhaps more interesting is the dark horizontal band just above the horizon in the photo and in the video. Some people see it and think it’s just the sky getting darker as the Sun sets. That’s kinda sorta true, but it’s more than that. It’s actually the shadow of the edge of the Earth on the sky! On a hazy day, have you ever seen the shadow of a cloud or mountain stretch across the sky? Particles in the air are lit by the setting Sun, but if the cloud or mountain blocks the Sun, some particles are shadowed, and appear darker. If conditions are right, this happens on a much grander scale, with the horizon of the Earth itself blocking the Sun. A brilliantly-drawn diagram showing the setting Sun and the shadow of the Earth projected on the sky. When the Sun is just below the horizon (on the left, west), air above your head is still lit up. But air far enough to the east (to the right) sees the Sun below the horizon, blocked by the Earth. That air is dark, so when you look to the horizon opposite the Sun you see a broad band of dark sky. As the Sun sets further, the top of the band creeps upward. Eventually the sky darkens completely once the Sun is far enough below the horizon. This is the same reason we have twilight, by the way. Without an atmosphere, the sky would darken the instant the Sun dips below the western horizon. Since this dark band is to the east, and the Moon was full and rising in the east as well, it appears to be inside the dark zone. Pretty! There’s an irony here, too. Technically, the Belt of Venus is the pinkish band just above the top of the Earth’s shadow line, and not the dark band itself. It’s name may come from that glow, referring to the girdle worn by the goddess Venus—I’ve seen that etymology bandied about, but I’m not sure it’s true. Anyway, the irony is that the planet Venus can never be in that part of the sky. Venus orbits the Sun closer than the Earth, so, due to geometry, can never appear more than about 45° away from the Sun. Since the Belt is opposite the Sun, 180° away, Venus can never be in it. And one more thing, since I can’t resist. Sullivan took this shot at Mono Lake, California. If that sounds familiar, that may be because it was the epicenter of the “arsenic life” brouhaha in 2012, when scientists claimed they had found bacteria that could metabolize arsenic; a claim that was later shown to almost certainly be wrong. It was fun for a while though. Sullivan took lots of pictures when he was at Mono Lake, and they’re all quite lovely. Go take a look. And of course the Belt of Venus itself is a fascinating thing to see in person, especially if you watch it over a few minutes and see it slowly move upwards. All you need is a good sunset and a clear view to the east. Give it a try! There’s a lot going on in the sky all the time, if you just go out and look up.